Are you sure you want to know? : Happy Birthday You Queen! 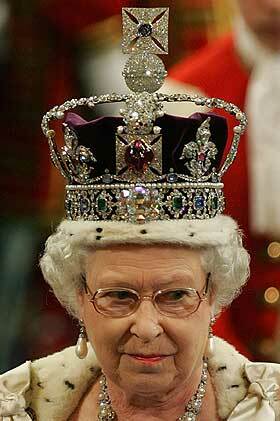 From one Queen to another Happy 80th Birthday to you. Anyhow, thats my six degrees of seperation (sp?) from the Queen. My grandmother reminds me of the queen. SHe just looks like her, and never swore around us kids. When I turned 20 and came home for the first christams in four years.. that was the first time I ever heard her say the F word and that was in refrence to my uncle. I thought I was going to fall of my chair, and by the look on my face everyone knew I was in total shock. Quite funny really. Look at that crown! She must have some sturdy neck muscles. Andi - Your endless pool of talent continues to amaze me! XM - I guess that's one good thing about being Canadian, you have the chance to meet the Queen! I've never met a President (seated or otherwise) but maybe that's a good thing. Magpie - Thank you, I think I'd look good with a crown too!